Sometimes a file that is stored in Elvis needs to be changed in some way and the changes stored back in Elvis for the same file, perhaps even as a different file type. This can be done by downloading the file, changing it and uploading it again whereby the original file is replaced. Note: InDesign layouts can be automatically opened in InDesign and are automatically updated in Elvis when they are closed in InDesign. When the file is edited it is important that other users are prevented from modifying that same file. The file is therefore locked for all other users until the file is checked-in again. This process is known as 'file check-out' and 'file check-in'. 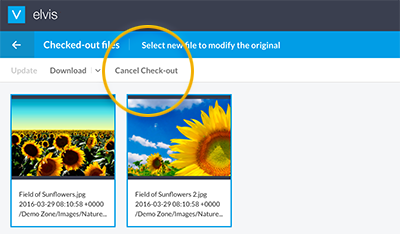 While the file is checked-out, other users cannot check-out, update (such as the metadata) or delete the file until the file is 'checked-in' again. Other actions are still possible such as downloading the original file, previewing the file, or sharing the file. Tip: Hover the mouse pointer over the icon to see the name of the user who has checked-out the file. 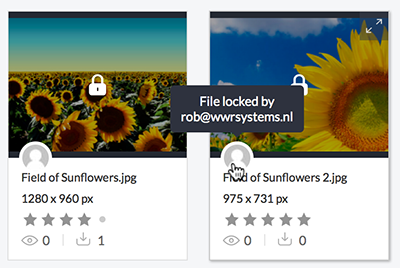 As long as a file is checked-out by a user, other users cannot check-out the same file. For them, the check-out option will be grayed-out in the menu. Two methods exist: one general method and one method especially for InDesign layouts. This method can be used for any type of file. Note: Although this method also works for InDesign layouts, the preferred method for checking-out layouts is described below under 'Checking-out InDesign layouts'. Step 1. Select one or more files that you want to check out. Step 2. Click Check Out in the menu bar. If you are using the default settings of the Web browser, the file is automatically downloaded to your Downloads folder. Step 3. (Optional, depending on how your system is set up) If the file is not downloaded automatically, save it manually. Step 4. Open the downloaded file, edit it in some way and save it (optionally in a different file format, requires Elvis 5.10 or higher). Another exception to the standard way of checking-out files is related to working with InDesign layouts. Although the steps described below also work for InDesign layouts, it is more efficient to make use of the InDesign integration in Elvis. Checking-out a layout is then done by right-clicking the layout and choosing Open in InDesign from the context menu. The layout is then automatically opened in InDesign. 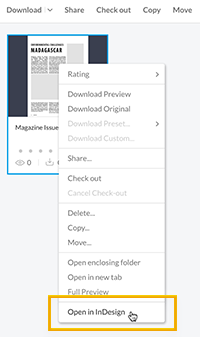 Checking in a layout is automatically done when the layout is closed in InDesign. Note: When using the method for InDesign layouts (see above), this step is not required: the layout it is automatically checked-in in Elvis after closing it in InDesign. After editing the file, you can update the version of the file that is stored in Elvis. Step 1. In Elvis, click Checked-out files next to your avatar in the top right corner. A page is shown listing all files that you have currently checked out. Figure: When clicking 'Checked Out' at the top of the page (A), the Checked Out page appears (B), showing all files that you have checked out. Step 2. Select one or more files that you want to update in Elvis. When a single file is selected, click Update in the menu. Hover the mouse over the thumbnail and click the Refresh icon in the top right corner. Step 4. Browse to the updated file (optionally saved in a different file format, requires Elvis 5.10 or higher), select it and click Open. The file is uploaded to Elvis and the original file is replaced. 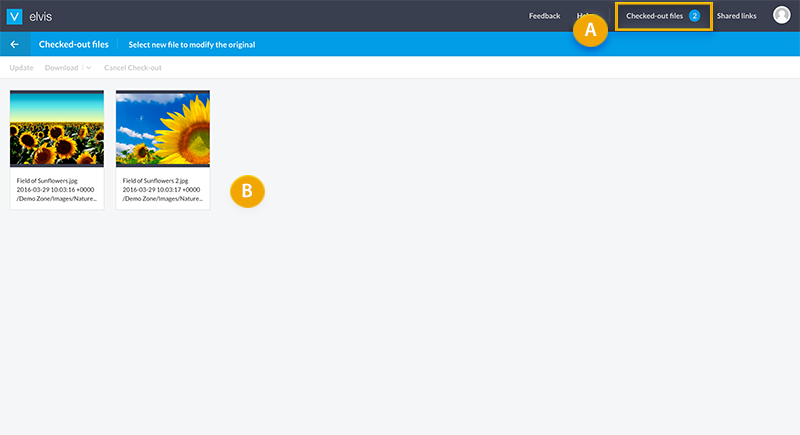 Note: You can leave the page while a file is being uploaded; the process will continue in the background. Step 5. (Optional) The checked-out files that were saved on your system are not removed, you may want to remove these manually from your system. In the Search results pane, select the files, click the 'More options' icon (the 3 dots) and choose Cancel Check-out. 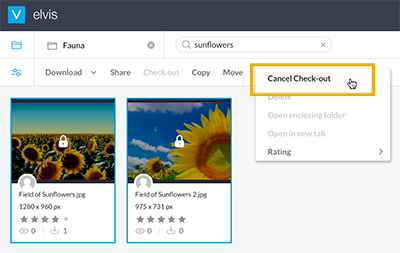 Click Checked-out files next to your avatar in the top right corner, select the files you want to cancel and click Cancel Check-out. Canceling the checked-out files does not remove the downloaded files from your system, you may want to remove these manually.